This Catalina Foothills custom home features 4 bedrooms, 3 baths with spacious, open inside and outside living areas for entertaining family and friends and a healthy lifestyle. 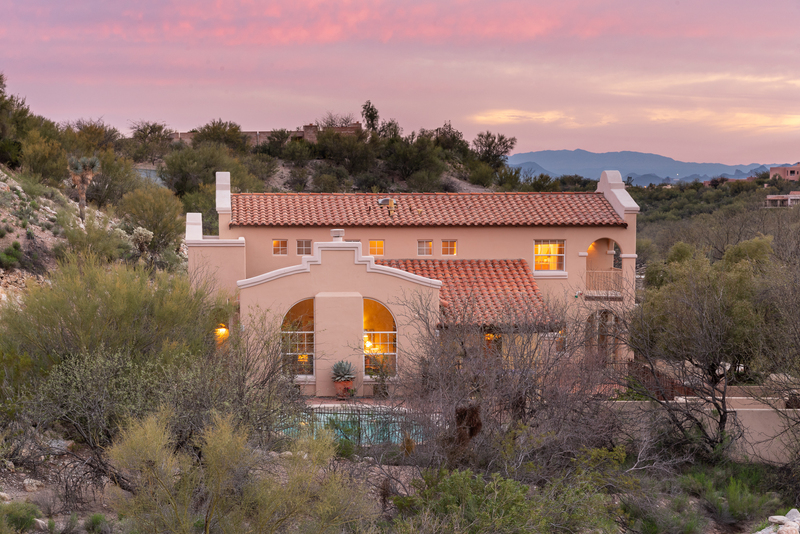 This charming, mission-style Catalina Foothills custom home has private access to an open natural area with fabulous walking paths, jogging, off-road cycling and bird watching, to name just a few. The versatile yard offers great entertaining opportunities, including a pool and spa, a vast above-ground garden, a separate fenced-in grassy dog yard and beautiful Catalina Foothills custom home mountain views and sunsets. This home is located in the heart of the Foothills, only minutes to restaurants, shopping, resorts, golf & schools (Catalina Foothills District 16). Enjoy relevant finishes including high ceilings & wood shutters & master suite with large walk-in & private patio. Both the interior and exterior have recently been painted. This Catalina Foothills custom home is not to be missed! Sitting in the heart of Tucson’s Sonoran Desert, the Catalina Foothills area boasts a lifestyle, views and entertainment Tucson is known for…art galleries, spectacular golf courses, the best restaurants and top-notch shopping. The mountain peaks of the Santa Catalina mountains off truly breathtaking year-round views, hiking and outdoor activities. At this Catalina Foothills custom home, you’ll have a front row seat. When you venture into this area look forward to a connection to nature like you’ve never felt before while maintaining access to some of the city’s greatest luxuries. If you’re looking to enjoy the perfect combination of serenity and action (and maybe take in an incredible sunset while you’re at it) then 5181 N. Calle Bujia is the place you’ll want to be.